If we are reading straight through a Bible book (currently Matthew), we take Wednesdays and Sundays off for a more general Christian message. Saint Andrew, by François Duquesnoy, ca. 1633. 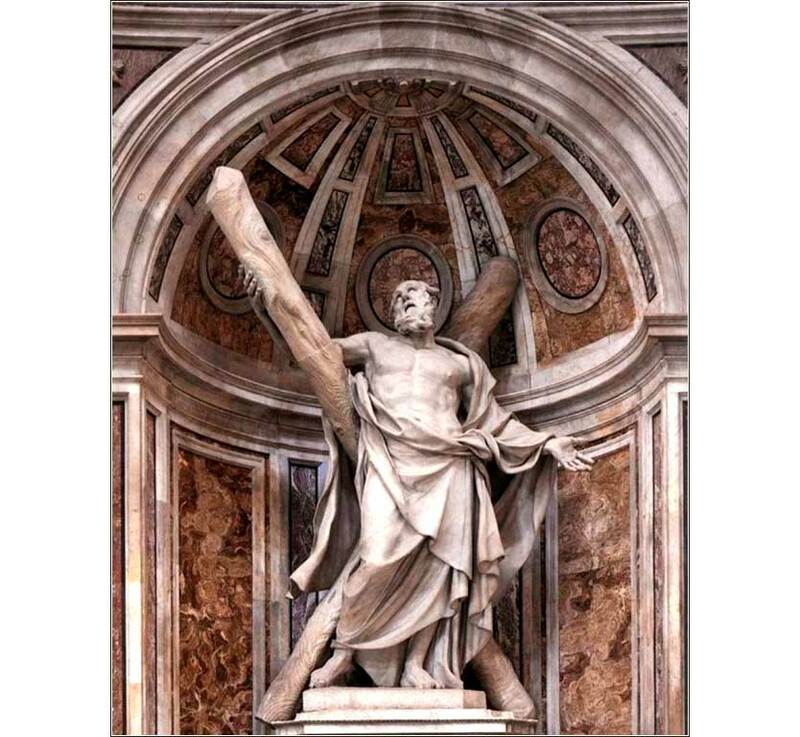 This magnificent statue in St. Peter’s Basilica (Rome) shows Andrew at the moment of his crucifixion, on the famous "X" shaped cross. 531 people in our community are currently praying with you. 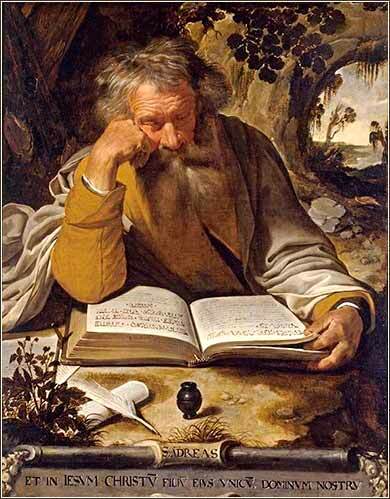 Saint Andrew by Artus Wolffort ca. 1620. Prayer is not monologue, but dialogue. Gods voice in response to mine is its most essential part. Then they returned to Jerusalem from the hill called the Mount of Olives, a Sabbath day's walk [a little less than a mile] from the city. When they arrived, they went upstairs to the room where they were staying. Those present were Peter, John, James and Andrew; Philip and Thomas, Bartholomew and Matthew; James son of Alphaeus and Simon the Zealot, and Judas son of James. They all joined together constantly in prayer, along with the women and Mary the mother of Jesus, and with his brothers. This meeting, recorded in the first chapter of Acts, is the last mention of Andrew in the Bible. Although it is difficult and perhaps impossible to know what actually became of Andrew thereafter, without doubt he traveled widely and actively spread Christ's Gospel to many people. Andrew was the first apostle to follow Jesus and was also the oldest -- a year older than Jesus himself. He was a follower of John the Baptist. When Christ was baptized by John, Andrew followed Him and brought his younger brother, Peter, who apparently was a gifted and charismatic speaker. Andrew was reputedly the first to record the teachings of Jesus in writing, but we have no idea whether or to what degree any of his writings still exist as part of the Gospels in our Bible, or elsewhere. The originals were reported to have been collected in the Great Library of Alexandria (in Egypt), which was subsequently destroyed by fire. There are many traditions about Andrew. Most agree that he traveled north to the Ukraine (then called Scythia) and Georgia. He became the patron saint of Russia, the Ukraine, and Romania; many Russian flags contained a Cross of St. Andrew similar to the flag of Scotland. Most accounts agree that he ended his travels in Patras, Greece (a city about 130 miles west of Athens), where he was crucified on a cross laid in the shape of an "X". The stories about the disposition of his remains are even more colorful than the accounts of his travels. Many churches claim to have received and enshrined parts of his body. Most notably, when the Emperor Constantine (son of Constantine the Great) ordered that Andrew's body be exhumed and brought to Constantinople, a monk named Regulus reportedly was visited by an angel, who instructed him to take Andrew's remains and flee to the farthest ends of the world. Regulus took such remains as he could manage and fled, only to be shipwrecked in Scotland, where the remains were enshrined. Thus, Andrew became the patron saint of Scotland, and the Scottish flag represented the cross he died upon: a white "X" shape on a blue field. The purported remains were destroyed or stolen during the Scottish Reformation, but we see his influence even today in the British flag (the "Union Jack") and the flag of the Scottish Parliament.